A young Accrington Stanley footballer has died, the club has announced. 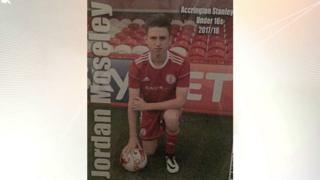 Jordan Moseley, who played for the under-16s academy team, died on Tuesday night. Chairman Andy Holt said it was "so very sad". The club said the youngster would be "forever part of the Stanley family". A spokesman added: "The thoughts and condolences of everyone at Accrington Stanley go out to all of his family and friends at this difficult time."